Writers block doesn’t scare Linda Nemec Foster–she’s always writing. As Grand Rapids’ first poet laureate, from 2003 to 2005, her literary oven is always cooking, although she hesitates to talk about the projects that are still in the works. “I’m superstitious. If I talk too much about a project when it’s still in the hopper, I feel a little bit uncomfortable…I don’t want to jinx it,” she says. “I always tell people I have three children, a son, a daughter, and the Contemporary Art Series,” Linda says. “It just really opens up the whole world of great literature to the community, and it’s not just a once a year or certain genre, it’s all facets of the writing life,” she says. Writing has been a mobile passion in Linda’s life since she put pen to paper seriously in the ’70s. “I took my first creative writing class in poetry at Wayne (State University) when I lived in Detroit. My husband went to Wayne (Medical School), and I took classes from a poet. Her name was Faye Kicknosway,” Linda remembers. 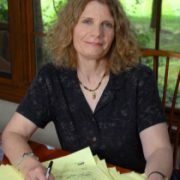 Linda’s post-graduate classes supplemented her Bachelors Degree from Aquinas, and she later earned a Masters in Creative Writing from Goddard College in Vermont. There, Linda studied under the likes of Raymond Carver, Donald Hall, Lisel Mueller, Robert Hass, and Tobias Wolff. “They had a remarkable faculty of writers that were just beginning their careers. Many went on to very famous careers. They were our teachers! It was quite a remarkable program. Boy, did I cut my teeth,” she says. Originally Published by West Michigan Woman, click here to view article.